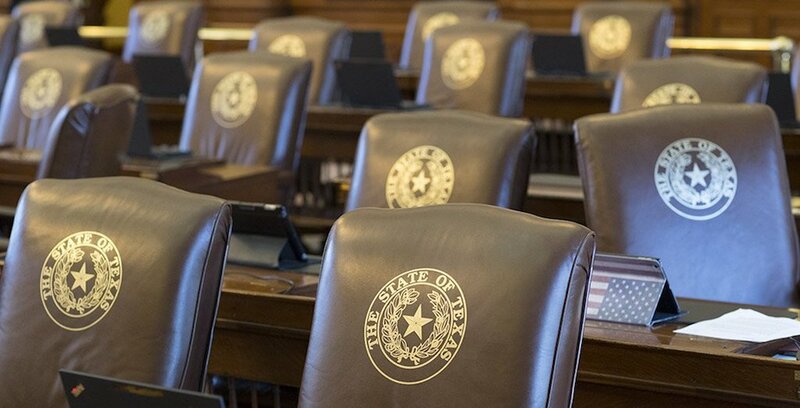 Republicans currently hold a 95- to 55-seat advantage over Democrats in the Texas House of Representatives. Data on voters’ partisanship, affinity for President Donald Trump and ideology in the 150 Texas House districts suggest that as many as thirteen Republican-held seats are potentially vulnerable to being flipped to the Democrats in 2018. This stands in contrast to three similarly situated Democratic-held seats, leaving House Republicans primarily on the defensive this election cycle. The data underscore that Dallas County is the epicenter of the battle to shift the balance of partisan forces in the House, with half of the Texas House seats in play in 2018 located within that county’s borders. To create the principal composite index examined here, the Partisan-Trump Index (PTI), those two indexes are summed together. The logic behind the PTI is that in 2018 voter behavior will be influenced by both their natural partisan inclination (measured by the PVI) as well as by their position vis-à-vis President Trump (measured by the TVI). The higher the PTI, the more favorable a district is expected to be for a Republican candidate in 2018 and the lower the PTI, the less favorable — and vice versa for a Democratic candidate. A final indicator used to evaluate the vulnerability of a district is the ideological orientation of its registered voters. This indicator was calculated using aggregated data from the 2011-18 period for a question in the University of Texas/Texas Tribune Poll which asks respondents to place themselves on a one-to-seven scale, with one being extremely liberal and seven being extremely conservative. Republican-held districts with registered voters whose mean value on this scale is located in the most liberal quintile of the 150 districts were identified as “Left-leaning” Republican districts (seven total) while Democratic-held districts located in the most conservative quintile were identified as “Right-leaning” Democratic districts (one, HD-80, represented by Tracy King of Batesville). The first table displays the 15 Republican-held House districts with the lowest PVI values. Ten Republican districts have PVI values below 15.0. All ten, however, have PVI values greater than 5.0, with only three less than 10.0, suggesting that if voting behavior in 2018 is driven primarily by partisanship, only a few Republican-held seats appear potentially vulnerable: HD-105 (Rodney Anderson, R-Grand Prairie), HD-43 (J.M. Lozano, R-Kingsville), and HD-113 (Cindy Burkett, R-Sunnyvale, an open seat). A trio of Democratic-held districts have PVIs greater than -5.0: HD-107 (Victoria Neave, D-Dallas) at 6.8, HD-117 (Philip Cortez, D-San Antonio) at -1.7, and HD-144 (Mary Ann Perez, D-Houston) at -4.2. 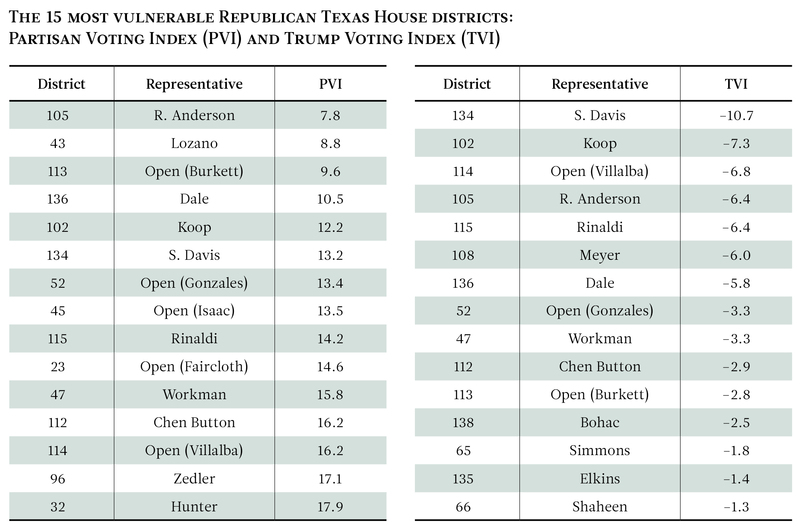 The table also displays the 15 Republican-held Texas House districts with the lowest TVI values. Trump won less than 50 percent of the vote in 18 Republican-held districts all together. Only two Democratic-held districts have TVIs greater than -7.5: HD-107 (Neave) at -6.6 and HD-34 (Abel Herrero, D-Robstown) at -6.9. 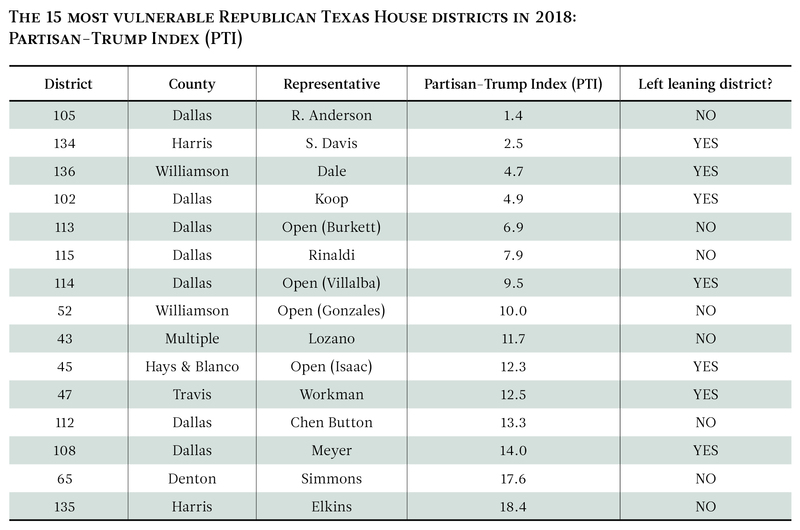 The second table lists the 15 most vulnerable Republican-held House districts in 2018 based on the Partisan-Trump Index (PTI). The smaller a Republican-held district’s PTI value, the more vulnerable it is to any type of blue wave in November. Conversely, the larger the PTI, the greater the height any blue wave will need to reach to sweep a Republican out. Also included is information on the district’s location, its GOP candidate in the fall, and whether the district is Left-leaning. It is important to keep in mind that this index focuses exclusively on the characteristics of the district, ignoring candidate-specific factors such as popularity, campaign finance resources and the possession of a strong personal brand ideally suited for their district. An extreme case is HD-134, where Republican Sarah Davis of West University Place is very popular, enjoys a large campaign war chest and has developed a robust personal brand as an independent voice in Austin that makes her the perfect candidate for her purple anti-Trump district. Thus, while HD-134 would be a very vulnerable district for a generic Republican, Davis's traits make her the favorite this fall. That said, HD-134 is a sui generis case, and the other Republican candidates in vulnerable districts will not benefit from as strong a personal vote as Davis this year. Seven GOP districts have PTI values under 10: HD-105 (R. Anderson), HD-134 (S. Davis), HD-136 (Tony Dale, R-Cedar Park), HD-102 (Linda Koop, R-Dallas), HD-113 (Burkett), HD-115 (Matt Rinaldi, R-Irving), and HD-114 (Jason Villalba, R-Dallas, who lost the GOP primary to Lisa Luby Ryan of Dallas). Four of these seven districts are Left-leaning (HD-134, HD-136, HD-102, and HD-114), making the Republican candidates even more vulnerable than suggested by the low PTI value. Six additional GOP districts have PTI values between 10.0 and 15.0: HD-52 (Larry Gonzales, R-Round Rock, an open seat), HD-43 (Lozano), HD-45 (Jason Isaac, R-Dripping Springs, an open seat), HD-47 (Paul Workman, R-Austin), HD-122 (Angie Chen Button, R-Richardson), and HD-108 (Morgan Meyer, R-Dallas). Half of these districts are Left-leaning (HD-45, HD-47, and HD-108). Two districts round out the 15: HD-65 (Ron Simmons, R-Carrollton) and HD-135 (Gary Elkins, R-Houston). Their PTI values are sufficiently high that for the GOP to lose the districts would require either a massive blue tsunami or a serious unforced error by a seasoned GOP candidate. HD-107 (Neave), HD-117 (Cortez), and HD-34 (Herrero) are the only Democratic districts with PTI values (0.2, -6.8, and -13.1) that suggest they could be vulnerable to being flipped in November (and when one factors in differential candidate quality, HD-34 would appear to be quite safe). The next most vulnerable Democratic districts, HD-144 (Perez) and HD-118 (Tomas Uresti, D-San Antonio, who lost the Democratic primary to Leo Pacheco), have PTIs (-15.9 and -18.7) that indicate a GOP victory in 2018 is unlikely. Of the 16 districts (13 Republican and 3 Democratic) identified here as being most vulnerable to changing partisan hands in November, eight are located in Dallas County. Therefore, the better the Democratic Party’s countywide performance in Dallas County, the larger its gains will be in the Texas House. Another four districts are located in the Greater Austin area, where population growth and housing expansion bleeding out of Austin along the I-35 corridor has begun to turn the districts in neighboring Williamson and Hays counties purple. Rice University has been a financial supporter of The Texas Tribune, a nonprofit, nonpartisan news organization that is funded in part by donations from members, foundations and corporate sponsors. Financial supporters play no role in the Tribune's journalism. Find a complete list of them here. 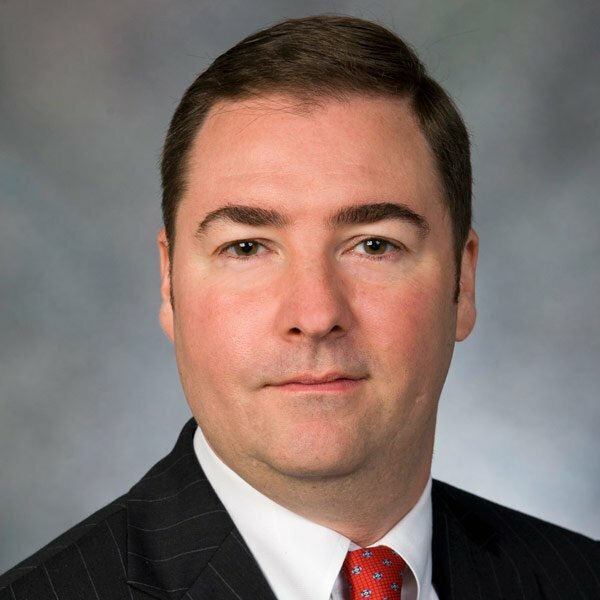 The PVI uses district-level vote results in statewide judicial elections featuring candidates from both major parties to gauge the partisan orientation of a district. Judicial elections provide an excellent measure of partisanship, since relatively few voters are familiar with the individual candidates, and thus tend to cast their votes primarily based on partisanship. In addition, there are multiple statewide judicial elections every cycle, smoothing out idiosyncrasies of particular candidates or races. The PVI is the difference between the sum of the mean vote share of the Republican statewide judicial candidates in 2014 and the mean vote share of the Republican statewide judicial candidates in 2016 divided by two, minus the sum of the mean vote share of the Democratic statewide judicial candidates in 2014 and the mean vote share of the Democratic statewide judicial candidates in 2016 divided by two. The higher the PVI, the more Republican a district is, while the lower the PVI, the more Democratic a district is. The PVI values range from a high of 83.8 in HD-86 (John Smithee, R-Amarillo) to a low of -73.3 in HD-110 (Toni Rose, D-Dallas), making those the most Republican and Democratic House districts in the state. The second indicator is the Trump Voting Index. The TVI is the share of the presidential vote won by President Trump in the district in 2016 minus 50. Positive TVI values represent the extent to which Trump won more than half of the vote in the district while negative values indicate how far Trump was below the 50 percent mark. HD-60 (Mike Lang, R-Granbury) is the most pro-Trump district with a TVI of 33.8 (Trump won 83.8 percent of the vote) while HD-110 (Rose) is the most anti-Trump district with a TVI of -38.7 (Trump from 11.3 percent).